The propagation of the so-called 'magnetic fire' in certain systems seems to be "the only combustion process ruled by quantum laws known in the nature", points out Javier Tejada, Professor of Condensed Matter Physics at the University of Barcelona and one of the authors of a study recently published on the journal Physical Review Letters (PRL), which uncovers how energy is released and dispersed in magnetic materials in a process akin to the spread of forest fires. The study, carried out by researchers from New York University (NYU), the University of Barcelona, the City University of New York (CUNY), and the University of Florida, has enabled to control some aspects of the reaction by magnetic fields manipulation. Besides, such knowledge of magnetic reactions is important in designing magnetic materials for energy storage applications. This is because magnetic fire can lead to a rapid and uncontrolled release of stored energy, producing significant energy loss in, for example, an electrical generator. Forest fires spread because an initial flame or spark heats a substance —a trunk or branch—, causing it to burn, which releases heat that causes the fire to spread to other trunks or branches, turning a small spark into a self-sustained, propagating front of fire that can be deadly and is irreversible. 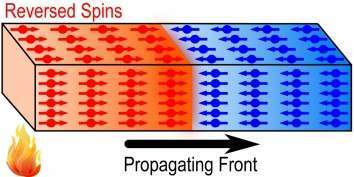 In the case of magnetic materials, researchers concluded that a spark is needed to begin this process, which begins when spins, as atoms' magnetic poles, flip in materials. The difference is that in this case spins continue to be flipped at the end and, unlike forest fires, the process can be reversed. "It is important to highlight that these processes can be usually found in nature, such as cell growth or the spread of information", remarks Ferran Macià, co-author of the study and postdoctoral researcher at CUNY. The first experiments that revealed the existence of magnetic fire date back eight years, and were developed by the group led by Myriam P. Sarachick, Professor of Physics at CUNY. As a result of this work, the UB research group discovered the so-called 'quantum magnetic deflagration'. In the study, highlighted by a viewpoint on the journal PRL, scientists also established that "in – magnetic materials, the activation energy responsible for producing the reaction can be controlled by magnetic fields; this enables to carry out systematic studies of the physical mechanisms of energy flux", according to Saül Vélez, PhD from the UB who works as postdoctoral researcher at the Nanoscience Cooperative Research Center (CIC nanGUNE) in the Basque Country. This process is different form chemical combustion ones, in which to control aspect such as activation energy or released energy is a difficult task. To achieve this control, researchers surmised they could produce such a 'spark' through a series of spins, the chemical equivalent of striking a match. In this case, they employed small single crystals of a molecular magnet that could be magnetized, much like the needle of a compass. Researchers provided a pulse of heat as the spark, causing molecular spins near the heaters to flip in a magnetic field, a process that released energy and transmitted it to nearby material. Moreover, "in these new experiments we were able to control the speed of this process by adjusting the make-up of the magnetic field to see under what conditions energy is released and how it propagates", affirms Macià. "These are exciting results; they have prompted us to further consider whether a spark is even necessary to start a magnetic fire," added Andrew Kent, Professor of Physics at NYU and Director of the laboratory in which the experiments were made. The UB group, led by Javier Tejada, established also that magnetic fire propagation is produced in a great variety of materials and, in some cases, it is accompanied by really quick changes in electric resistance or crystal structure. In the first case, it is observed that, as magnetic fire propagates, materials turn from electrical insulators into conductors. In the second case, it is proved that "as magnetic fire propagates, the structure, in this case a solid's order of atoms, is changed into a new structure, in order words, a new order of atoms is created", explains Tejada.